This month started with an amazing African Drumming and Boomwhacker workshop for the Suzuki Violin group residential at Queen Mary's School in Baldersby Park, Thirsk, North Yorkshire. The Suzuki Method of music education is based on the philosophy and teaching methods developed by the Japanese violinist, pedagogue, educator and humanitarian, Dr. Shinichi Suzuki. Dr. Suzuki believed in the great potential of music to enrich children’s lives. He developed a method of music education to enable children to play music totheir highest possible level of ability. His method was derived from his observation of the ease and facility with which young children learn to speak their own language. He analysed and adapted these precepts of language development into a system of music education which was aptly named the ‘mother tongue’ approach. On arrival at the venue, we were greeted by a young string ensemble who were creating the most exquisite sound on their violins. We knew we were in for a very special day. Given the high quality of the musicians present, we knew we would have to 'up our game'. The drum circle at the beginning was outstandingly amazing! 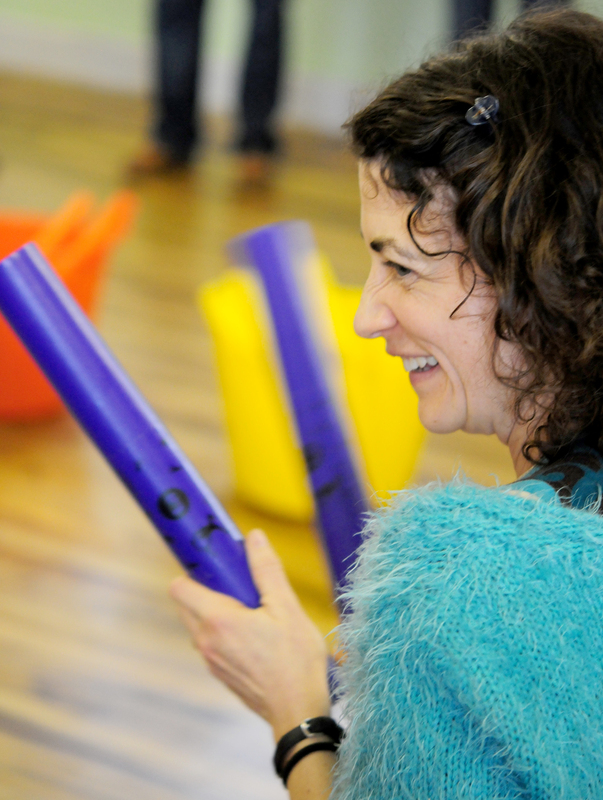 100 people from 4 years upwards (children, parents and music teachers) all came together to create an amazing sound. The room's grand high ceiling was perfectly suited to the scale of the drum circle as the sounds and beats reverberated throughout the huge hall. Who could imagine facilitating a family group who were all experienced musicians with an already strong sense of rhythm and timing?! Here is the footage from your drumming and Boomwhacker session. Please forgive my clumsy shakiness of the camera - you were all so amazingly brilliant I think my hands were trembling. (In the Boomwhacker video) Despite the shakes I think you will agree that it captures (at least) some of the magic. You can hear the F and D (lime green and Orange) putting the wonderful 3 pulse over the 4 pulse of everyone else - to sustain this is unheard of with normal community events! Then there is the conversations going on between the E ( yellow), the Gs (green) and the high and low C (red) and the light purple B# (or is that Bb?). Then the final thing - everyone is moving and grooving!!! It was a travesty to have to abruptly finish things last night! It felt like we could have played till Xmas! I'm not joking about this but you were so good I could have cried! 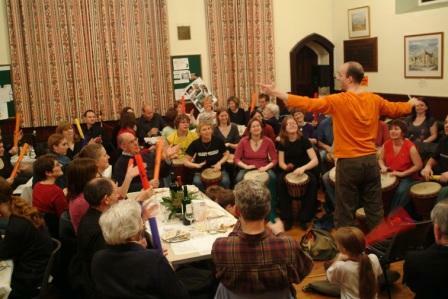 We provide outstanding African drumming workshops for festivals, galas, corporate events and celebrations throughout the UK in cities such as London, Sheffield, Leeds, York, Leicester, Chester, Nottingham, Birmingham, Manchester and Stockport - to name but a few!